If you are trapped in how to convert image PDF to editable Word file, maybe you need to read the following paragraphs, which can be your perfect method to realize it on your computer. Please download installer of PDF to Word OCR Converter, then double click this installer on your computer, and follow setup wizard step by step till PDF to Word OCR Converter is installed on your computer successfully. Or you can click button of “Add PDF Files” on interface of PDF to Word OCR Converter in order to add PDF file for this process step by step. 3. 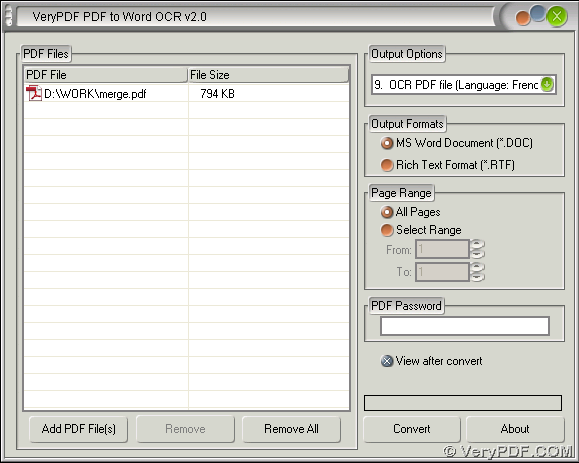 For PDF to Word OCR Converter can not only help you process image PDF files, but also help you process normal PDF files, so if you want to convert image PDF to editable Word, you need to use output options on interface of PDF to Word OCR Converter: click dropdown list of “Output Options” > select “OCR PDF file (language …)” there, for example, if PDF language is French, you need to click “OCR PDF file (Language French)” on dropdown list in order to make PDF to Word OCR Converter helps you process PDF file more accurately. 4. After that, if you want to set output file type, please click one of radios of “MS Word Document” and “Rich Text Format” on interface of PDF to Word OCR Converter, then after conversion, PDF to Word OCR Converter can help you produce Word file of DOC or RTF. If you want to preview Word file after conversion, please click check box of “View after convert” on interface of PDF to Word OCR Converter. 5. To save Word file and produce Word file, please click “Convert” button on interface of PDF to Word OCR Converter > select a folder in dialog box of ‘Save As’ > click ‘Save’, then PDF to Word OCR Converter can help you produce Word file quickly, which also can be previewed on your screen automatically. 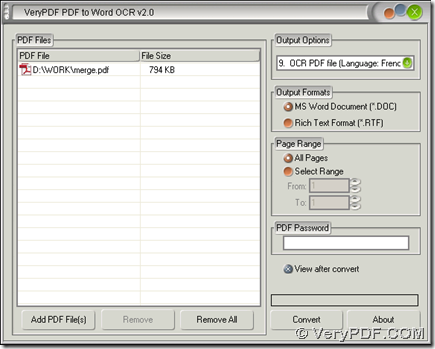 To know more of PDF to Word OCR Converter, please go to homepage of PDF to Word OCR Converter. To get answers on your questions about process to convert image PDF to editable Word with PDF to Word OCR Converter, please drop your comment here, we will give you a perfect support! How to rotate the page when converting HTML to JP2? Convert pcl to postscript and rotate page via command line? How to convert MS Office Word documents of doc to avs?